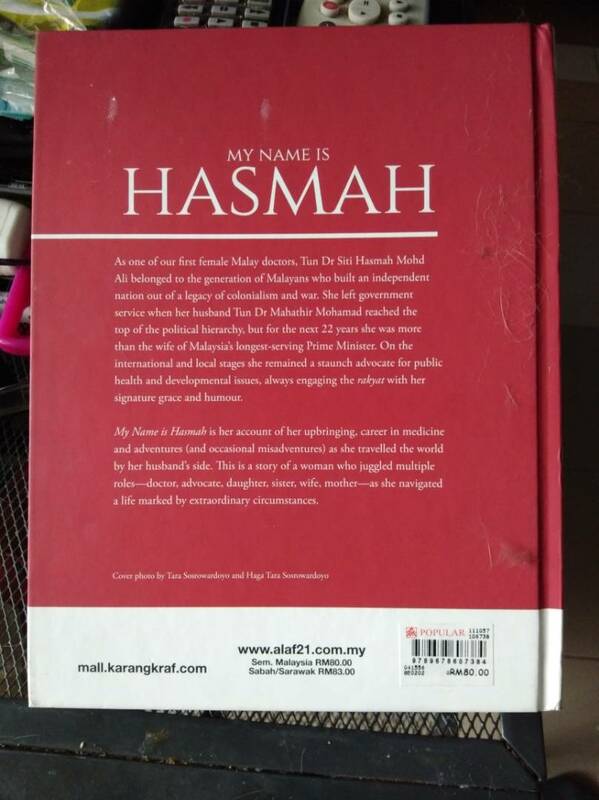 My Name is Hasmah - The book that gives me goosebumps | ♡ Memorable life, take a picture! I had been wanting to read this book for so long. As soon as I saw it being advertised at book shops. I am not sure why, but there's something about Tun Hasmah that I want to learn more. The price was set at RM 80 so that had put me off from buying because I feel that it was a bit expensive (but I don't mind splurging on stationaries, hehehe). I figured that I should ask Mr H to buy me this book as a birthday present. He happily agreed though, because he used his student's card and got additional discounts... pffttt! So this was my birthday present for 2017 from Mr H. I was so excited getting the book that I hold it close to my chest and gently stroking it like it was some kind of a pet. And yes, people were all looking at me but I didn't care. I have My Name is Hasmah now in my hands, do they? *Flip tudung. As soon as we arrived home, I quickly did all my chores like praying and doing laundry, and straight away hop on the bed. Pulled the cover and switched on the air-cond. Now, that's what I called, heaven.. I stopped twice for Asar and Maghrib prayers. Hesitantly, putting the book down because Mr H was already giving me the 'Mr H stare'. Seriously the book is soooooo entertaining that I finished reading it in 6 hours. There are just so many things about this book that I love and can relate to us both. I guess it's because the love this couple has in them. They are just both so cute. You are not going to regret a thing! 1. Tun Hasmah took nearly ten years to be a doctor. Hmmm.. sounds familiar, because Mr H took 10 years to finish his Law Degree, hahaha. 2. Originally, their dates focused on Tun Mahathir trying to tutor Tun Hasmah and get all fiery because he could not understand why Tun Hasmah did not get the point of such simple things, simple... according to him. 3. 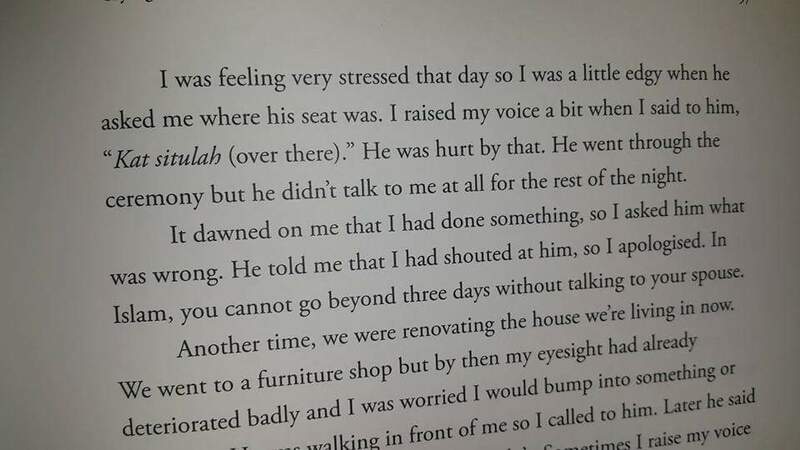 Tun Hasmah has problems with her eyesight which Tun M always get irritated with and to complement, Tun M has problems with his hearing which upsets Tun Hasmah at times. Yeah, this is so us... I am not sure why my eyesight had gone from bad to worse and it annoys Mr H when he pointed at something and I couldn't see. On the other hand, I am irritated when I call out his name and he just turn a deaf ear. 4. OMG! You should definitely read this page. I feel like the author is somehow talking about Mr H instead of Tun M.
Are they twins or what??!! Do you know that Mr H is also a super sensitive and very emotional kind of guy. Yeah, he's in denial about it and there's no way of telling from the look of his face, I know, I know. But this is factually him. 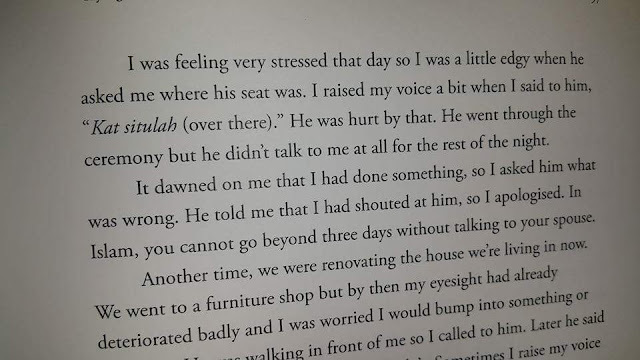 Whenever I, unintentionally ,raised my voice to him, usually because I had called him few times and he didn't answer (he was the one with the hearing problem, remember) he would sulk at me for hours. There were so many times where I would be dumbfounded, not knowing what I had done wrong and when prompted, he would say I had been harsh towards him.. when all I said was just, "It's dinner time", hahaha. I know they are second cousins and all, Mr H and Tun M, but reading this book is scary... it's like reading about us too, hahaha. 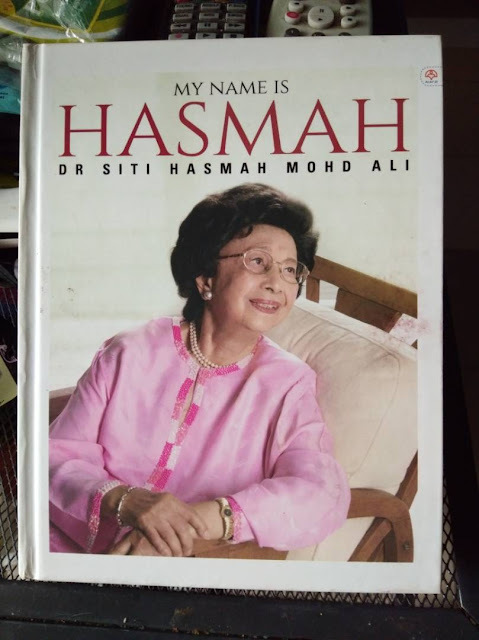 There were funny moments that Tun Hasmah recalled and embedded in the book and I feel that it's like a mother telling her daughter a story. A story about life. It's so inspiring and to say that Tun Hasmah and Tun M, had never stumbled in their life is absurd. They are just normal people who face challenges like all of us did.